We had one day left before our half marathon so we decided to squeeze as much in as we could in the LA area before heading to Anaheim! Wanting to sleep in, we decided to leave at 9am but being the early riser I am, I was wide awake at 7am. I stalled until 7:30am but finally decided to just get up and get ready. I tried to do it quietly (I did my makeup on the bathroom floor) but that didn’t work and we were all up shortly after and out the door by 8:30am! Our first stop was Hollywood Boulevard. Our hotel was walking distance away so we hiked over, stopping for breakfast at Dunkin Donuts on the way including Neil Patrick Harris, the crew of Apollo 11, and Bobby Flay. We ran into Garth Brooks’ star and noticed there were a lot of musicians in that area. When I looked up, I realized we were in front of Capitol Records! We had spent so much time looking down reading the stars that we didn’t even recognize where we were! That was not our finest moment. We continued on, taking pictures of what seemed like a million other stars (I won’t bore you with those pictures) until we made it to a nice shopping area near the Dolby Theater with a great view of the Hollywood sign. Up until then, the area was pretty run down so it was nice for it to finally “feel” like Hollywood. Next was the Grauman’s Chinese Theater. The area was so crowded and we were short for time because we needed to check out of the hotel. We decided to bail and come back with the car. It was a long walk back at that point but the weather was amazing. We got our bags and headed back to Hollywood Boulevard with the car to finish what we started. It was cool to see so many signatures and prints at Grauman’s, especially the older ones like Shirley Temple. 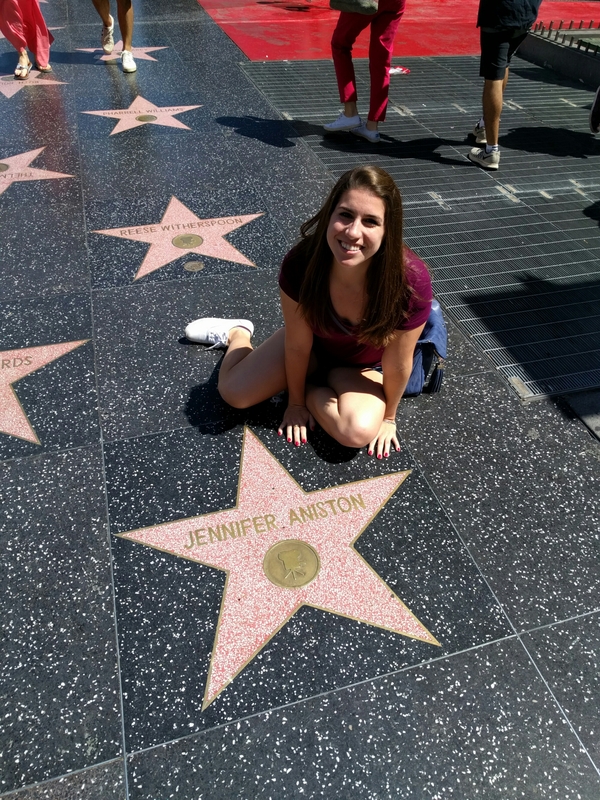 I was most excited when I found Jennifer Aniston’s though! It was hidden by a photo stand but I snagged a picture anyway. We kept walking, enjoying more stars, and made it to the end… of one side! Crossing the street, we headed back down the other side. We had some better views of the theaters from that side, too. By this point, we were ready for lunch. We made our way back to the shopping center and grabbed a bite to eat at the Hollywood Hills cafe. We also enjoyed an amazing churro afterward! I had really, really wanted to find Jennifer Aniston’s star but we hadn’t seen it yet and while there wasn’t much of the strip left, we were kind of over it. I decided to Google the location and guess what… her star was exactly where we had started that morning, just across the street. Of course, right? Thankfully, Kelsey and John were willing to humor me and we drove down there and snagged a picture before heading to Santa Monica. What you can’t tell from this picture is that the ground was scorching hot and my shins were on fire! Worth it. We left Hollywood around 2:30pm and drove by the most amazing houses ever, and some not so amazing ones. We started to look up the costs online and all were over a million. One was $3.9 million… seriously, why!? We made it to Santa Monica an hour later. Parking was tough but we managed to grab a spot and head towards the pier. I’m chronically cold so I thought it was a little chilly outside, especially as we got closer to the water, but still nice! I wouldn’t trade it for 100 degree Texas heat but a jacket would’ve been amazing. I tried, and failed, to swing from a branch on the way there. The pier and beach were crowded but beautiful. We walked along the shore and I kicked off my shoes to walk through the water. We explored the pier and enjoyed a delicious funnel cake too. The pier serves as the end of “route 66” so we walked to the tip and saw a seal swimming around. Venice Beach wasn’t too far so we headed there next. At that point we were kind of just going to say we went so we didn’t stay very long but it was still very beautiful… and cold! Between being cold outside and cold in the car, I really just wanted a big warm blanket! After Venice Beach, we traveled an hour to Anaheim to check in to our hotel. It was getting late so we quickly headed to dinner at the Cheesecake Factory where we obviously ate too much and justified it by saying we were running the next day. We talked a lot about tomorrow’s race and had a good time! Kelsey laughed so loudly at one point that a random waiter walking by commented that he loved her laugh which only embarrassed her more! It sure made John and I laugh though. I seriously love getting to spend time with them and we’re all so lucky to be able to take this trip together! After a full day of walking, I developed blisters on my feet. That is not good because I don’t need a reason for my feet to hurt during the run! We’re all so exhausted and with a 4am wakeup call, I’m sure we’ll be asleep soon!